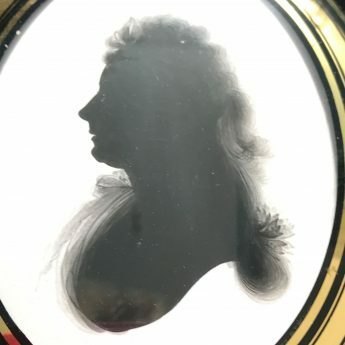 A fine silhouette painted on plaster showing Charlotte, Lady Teignmouth in profile to the left, wearing a fichu with a ribbon bow, her hair in the à la conseilleur style dressed with ribbons. 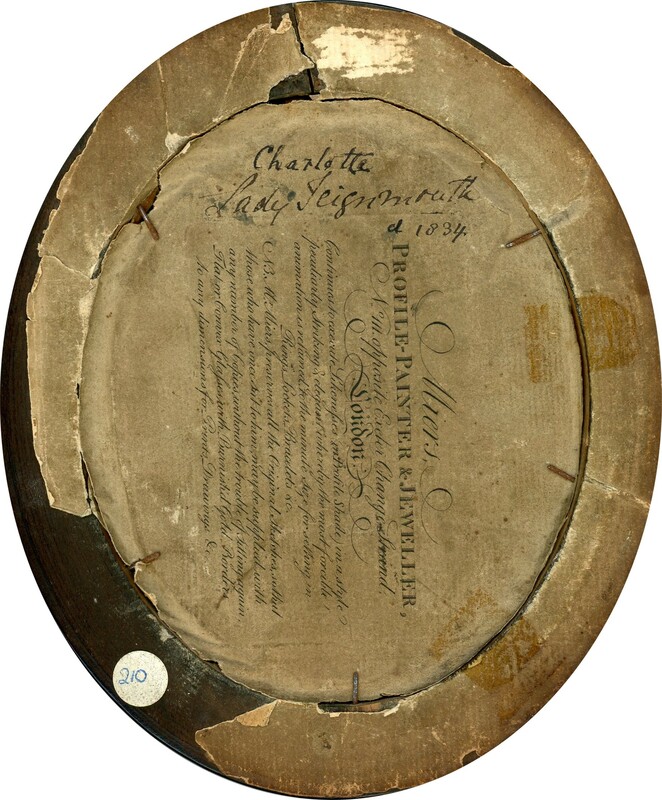 Born in September 1759, Charlotte was the only daughter of James Cornish, a doctor at Teignmouth in Devon. In November 1785 she was detained by a snow storm at the house of a newly-married friend and, whilst there, she met and instantly fell in love with John Shore, a friend of the family and an official of the East India Company. The couple were married on Valentine’s Day 1786. John returned to Calcutta thereafter but Charlotte remained in England but in 1790 John was summoned back to England to give evidence at the trial of Warren Hastings. In 1792, he was appointed Governor-General of India, thereby becoming a Baronet, and so returned to India. Lady Shore joined him two years later, escorted on the long voyage by her brother. The couple had nine children though three daughters died in infancy. An East India trade ship was named ‘Lady Shore’ in Charlotte’s honour. 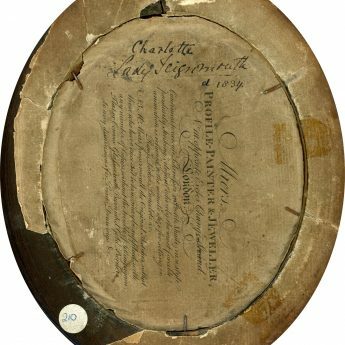 The Gentleman’s Magazine announced Charlotte’s death in July 1834 just five months after the death of her husband who had died on their wedding anniversary. The profile is painted on plaster and set in the original pearwood frame with a verre églomisé border. The reverse is backed with the artist’s trade label (no. 11). 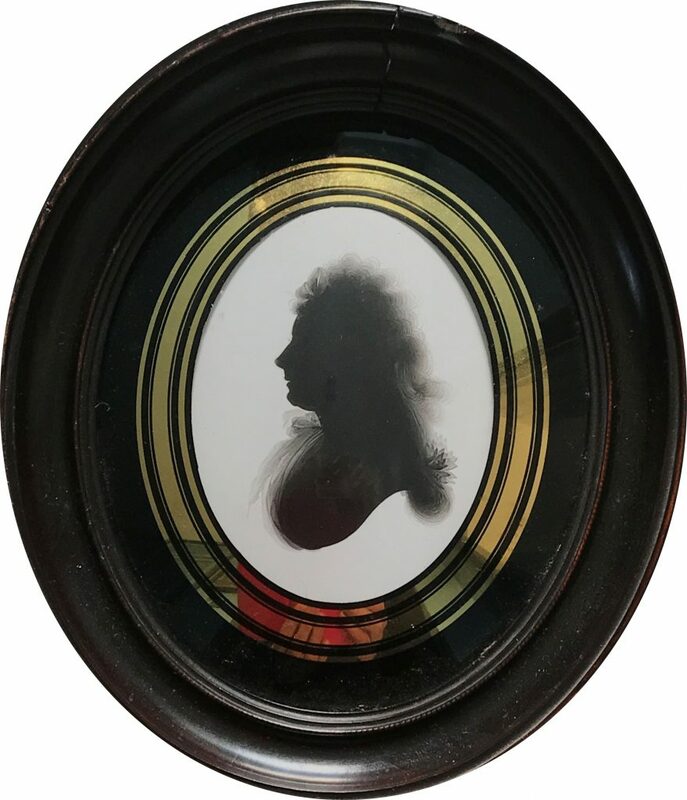 The silhouette is in excellent condition; the frame is cracked at 12 o’clock and has a couple of nibbles around the edge. 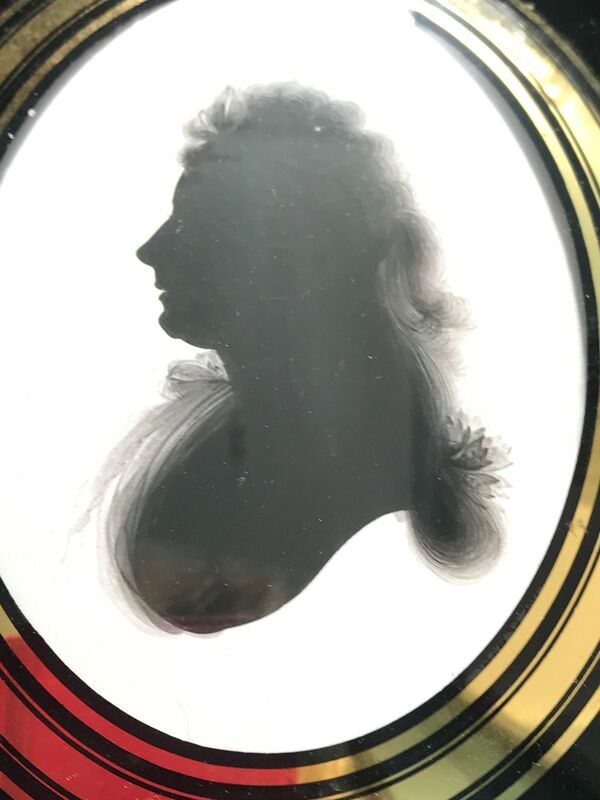 Although John Miers (1758-1821) never trained professionally, he is considered the finest of the 18th century silhouettists. He initially took over his father’s business as a coach-painter in Leeds and, keen to expand, advertised profile shades in miniature for 2s. 6d. each. He clearly excelled at them as this soon become his main line of business.